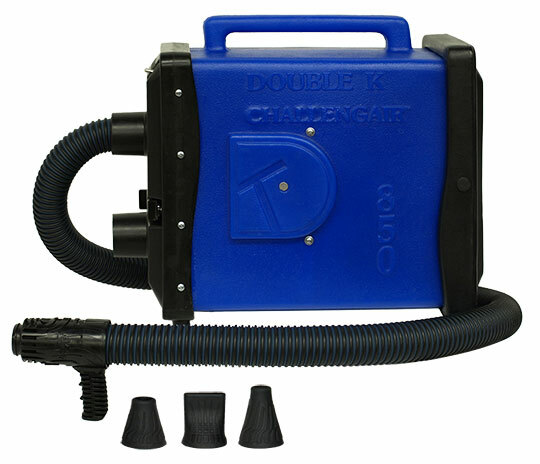 The Double K CHALLENGAIR™ 850™ High Velocity Dryer is the most effective and versatile dryer on the market. 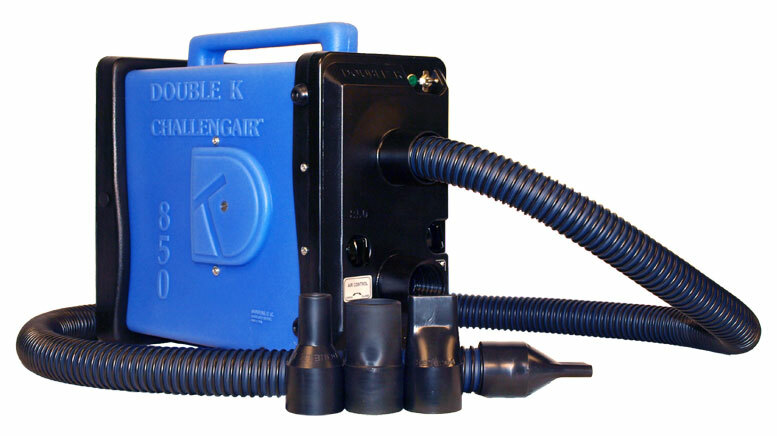 The CHALLENGAIR™ 850™ has no heating element due to the “flo‑thru” motor configuration. The air is warmed by the operational heat of the motor, which saves electricity and produces heat up to 45 degrees above room temperature. The high velocity air in concert with the “Air Sweep” nozzle will blow the water from the animals' coat and dry them faster. The CHALLENGAIR 850™ Animal Dryer offers great versatility using the assorted nozzles for the desired effect. The stand model can function as a conventional “Fluff” dryer, forced air dryer or cage dryer at the operator's discretion. Powerful air volume - motors produce up to 248 cfm. Sound damping foam lining reduces dryer noise. Cross-link polyethylene dryer housing is easy to clean and virtually indestructible. Two year limited warranty parts and labor. Stand or portable models available. “XL” model produces 15% more air volume. Regular 2 speed or variable (dial control) speed. IMPORTANT: Do not use variable control with a power inverter system. *Please specify options when ordering.